An Oklahoma man was the star of a Facebook video that shows him getting into a slight tussle with a rather frisky buck. In the video, Travis Hurst is seen squaring off with a frisky little buck who persistently charges at him forcing Hurst to grab the buck by the antlers and hold on for dear life – no pun intended. Hurst, who is a pastor in Shawnee, Oklahoma, says he was working on building a bonfire for his church when the apparent rut-crazed deer showed up. 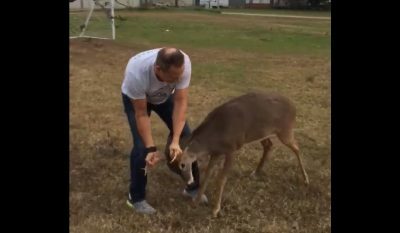 The video shows Hurst trying to back away from the animal, but the deer keeps closing the distance before finally lowering his head and charging. Hurst does the only thing he can, and grabs the frisky buck by the rack. “Why is he fighting us?” Hurst yells while trying to maintain his grip on the antlers. Eventually, the deer wises up and calms down, but not before leaving a couple puncture marks on the pastors leg! Deer attacks are certainly not common, however, they do happen from time to time. According to The Kansas City Star, Capt. Wade Farrar of the Oklahoma Department of Wildlife said the deer was likely accustomed to people. On top of that, the mating season has deer all jacked up and searching for other males to fight. He’s going to try to act like a big bad deer and if he thinks we are a threat, then he’s going to treat us just like he would a big buck out in the woods, Fox 4 reports Farrar saying. The post Frisky Buck Caught on Video Charging Oklahoma Pastor appeared first on OutdoorHub.